These cookies are necessary for our website to work and cannot be disabled in our systems. They are usually set only in response to actions you take that are equivalent to a service request, such as setting your privacy preferences, registering, or filling out forms. You can set your browser to block or warn you about these cookies, but then some parts of the site will not work. These cookies do not store any personally identifiable information. We use these cookies to analyze and identify the behavior of our Internet visitors. We track the IP address (anonymized) of the device you are using to identify you when you visit our website. Where possible, we combine your behavioral information on the Internet with the personal information you previously provided to us. This information is used to analyze the behavior on our website. We use these third party cookies for advertising purposes, to be able to retarget website visitors with relevant advertising messages on other websites, but also to make sure not to over expose you with the same ad. We may also use them to find other target groups based on interest and online behavior. These cookies are based on uniquely identifying your browser and internet device. In many ways successful lubrication is more about knowledge than the actual lubricant. Learn more about greases and how to apply them in our grease book (pdf format). Download "The Law of Least Resistance"
Lubrication of hydraulics is a major, key area in a wide range of industries. Here we provide some lubrication tips that can save energy, assure technical performance and extend the useful life of both the lubricant and the hydraulic systems. Advice about the right storage, smart cleaning and effective checks. Securing lubrication maintenance is a key component of Preventive Maintenance (PM). It also reduces the risk of operational disruptions and unplanned stoppages. And when people, machines and production resources work together optimally, quality and productivity increase. Many choose to change their cutting fluid and clean tanks, chip conveyors, etc. Others choose to save the fluid over the holiday periods. Whichever option you choose, there are some things to consider before a holiday break. Did you know...About over-lubrication More is not better, it's rather the other way around. Did you know...About a heated garage in a can No idling is good news for your finances and for the environment. Did you know...About the right hydraulic oil Choosing wisely pays off. Did you know...About the oil flow It's crucial that neither soot nor oxidation obstructs the flow of oil. Do you have the right oil in your vehicle? 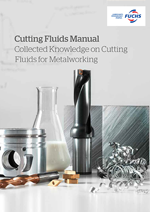 Collected Knowledge on Cutting Fluids for Metalworking. Smart Lubrication is a blog where we share our common knowledge about lubricants and lubrication. More in depth articles on current topics. Read or subscribe to our bi-monthly newsletter.